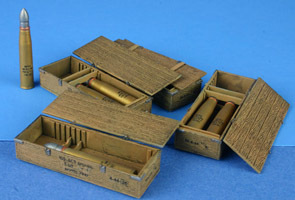 This kit consists of a set of 100mm ammunition and their transportation crates. 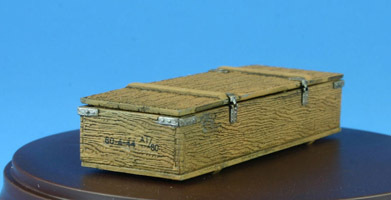 Included in the kit are 6 identical spruces with one set of decals for the markings on both the ammo and the crates. 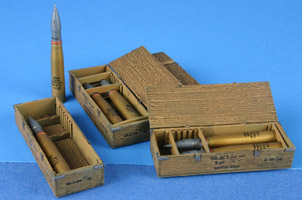 You can make either a UOF-412 High Explosive fragmentation shell and its corresponding crate or OF-471 High Explosive fragmentation shell and its crate. You can make all of one type or a mixture of both. I built 3 of each type. I used Tamiya Thin cement to glue the side and end parts to the base. This gives you a few minutes to get everything lined up and square. In step 4 make sure that when you add part 10, it is located up against the inside brace, not the end piece. When the shell casing is placed here the rim on the shell fits into the slot left by part 10. I glued lower support parts 11, 12, and 13 to the floor. You can leave them unglued which would match the original crate. It appears that these spacers would be moved to accommodate different shells according to the slot it was placed in. I did leave the upper supports 11, 12, and 13 unglued for ease of placement of the shells. The crate lid depicts latches and hinges. This requires you to glue the lid into a fixed position, so plan ahead as to how you want to show the finished crate. 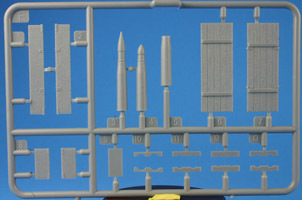 If you are going to depict the crate closed, you don’t need to add those inside parts as they will not be seen. The shells have noticeable mold seams that will need to be removed and smoothed over. I noticed that the shells did not match the photos in the instructions. There appears to be a double rib on the shell that is supposed to be painted copper, but the actual plastic piece only has one rib. I don’t know which is correct. The molding was generally good with a small amount of flash that will need to be removed. The molding of the wood grain was a little over done. It does make the grain standout though. The paint instructions call out paints for Testors, Tamiya, Humbrol, Revell, and Mr. Color. I found this very helpful as I had 3 of the 5 brands of paint as was able to choose with relative assurance that I was close to the color called out. However, the dark green was too dark and the black decals would disappear on that shade of green. I suggest that you go for a lighter green or for an unpainted wood color. 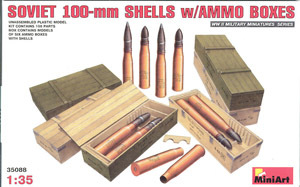 Conclusion – This set goes together quickly and makes a good looking set of crates and shells. They will be a welcome addition to a Soviet diorama. Thanks to Dragon Models USA for the review sample and IPMS/USA for the review space.